Ruling: The BMW 3 Series emphasizes performance and continues to lead the pack with intuitive handling, powerful motors , and a functional interior that is comfortable for short and long trips. The 3-Series is BMW's entry-level model in the near-luxury segment, offered in sedan, coupe, convertible and wagon versions. 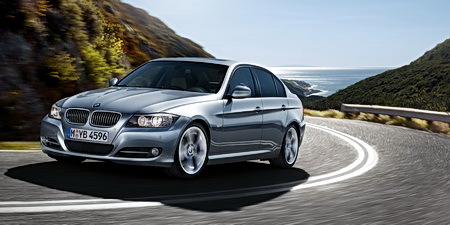 The BMW 3 Series has agile handling, a supple ride, and smooth, six-cylinder engines. The revised interior is comfortable and luxurious. Handling is taut and agile. A new 335d with an inline 6-cylinder twin-turbo diesel engine has also been added to the 3-Series lineup.The 335d runs clean enough to meet emission standards in all 50 states and produces 265 hp and an impressive peak torque of 425 lb-ft. Comfort, Sportiness, Handling, Power delivery, Low end torque, Steptronic paddle shifters, Styling. Some will prefer a softer ride(vehicle tested has sport suspension and 18 inch wheels). Where do I start? My spouse and I were looking for something a little safer than our prius for our family. So I took a trip down to the dealer to see what they had in store. After test driving two 335i's, I was sold on the car. Of all the cars I've owned, this is the one that has impressed me the most. With enough low end toque to pull a tree out of the ground, yet it's civil enough to put my 16 month old daughter to sleep on a cruise. Averaging about 24-26 MPG mixed highway/country back roads/streets. Topped with a 100k mile warranty and 100k mile no cost maintenance, this car quickly became a no brainer for my family. This car will be seeing many track days this year, I'm looking forward to seeing what the translation of power and great handling can put out on the racetrack. Acceleration, sport feel, and handling are awesome. Convertible is a little tight if you are over 6 feet but you can learn to live with it. One of the best cars I've ever owned. Bought the convertible for my wife and loved it so much that I preordered the 2009 335i sedan. Glad my wife prefers the 6 speed manual which I think is a must have for someone to truly enjoy the feel of true sports sedan. Originally looked at several other makes (Infinity, Lexus, Mercedes) but it is very difficult to find a car in a manual transmission that equals the 335i in handling and quality or workmanship. Prbably spent a little more than I needed but the care came fully loaded with the premium, cold weather, and sports package as well as the navigation system and ipod adaptor. Definitely worth looking at if you are in the market for a sport sedan or convertible. The sedan is also loaded and came to slightly less that 50K but I didn't get the ipod adaptor as the nav system/stereo can store all your CD's and Ipod music. Owned a BMW 328i, Accord EX, Lexus IS 350, Audi S4......335i outshined them all! The engine is strong and fast, the transmission with Vtech is fantastic, the interior, the outside look, the handling and response as well as the steering are superb. It advertises as 7.5 litres per 100 kms but it actually comes down to 10.3 litres per 100 kms, driven over a 2.5 year period. It blew blue smoke out the exhaust within 6 weeks of leasing it new and it constinues to consumes a litre of oil about every 5000 kms. The driver power window broke down a year and one-half after driving it as it would not roll up. It took the BMW Store over a week to get me in to fix this emergency ...I was not impressed! I had to replace the factory tires at 48,000 kms due to wear. The driver window squeaks when rolling it up, the handles on all the doors stuck in the open position and had them all replaced twice. From time to time I have smelled coolant in the interior while driving and the lights show false messages that send me into the dealer only to be told they were false and to ignore them...Frustrating!!! I have been told by one of my clients who is a mechanic for high end vehicles NOT to buy BMW's or Mercedes. BMW's after about 100,000 kms need a lot of expensive repairs. He sugggests the Lexus and Infiniti are the most bullet proof cars on the road today. From my experiences with this car, I will not be leasing or purchasing another BMW. The look, feel, handling and weight of this car is unsurpassed. The engine at 170 hp 6 cylinder is fast with quick response. It handles like a sports car and I love its feel. My wife and I think it is one of the sexiest looking cars out there. It has been really reliable and dependable. The wagon design is better in comparison to all other wagons of the same year range and up to year 2005. It is an eye catcher and for some reason, wagon are not common in my county, so it draws a lot of attention. Luckily, I bought an extended warranty when I bought my BMW, so the repairs -$5000 is covered. My advice - Never buy a used BMW without buying the extended warranty. Other complains with my BMW are as follows. Replaced Coolant tank after 3months of purchase - Very common problem - Join the BMW forums. Lots of squeaks and noises from the windows. Dealer says the motors for the glass may soon go out. Lots of brake dusts on my wheels. I use BMW approved brakepads purchased at the dealership. Lots of squeaks/noises from sunroof after you close it. I have to juggle, open and close the cover several times before i get some quiet. Squeaks and intermittent noise from the left hand corner - directly over the lamp switch. Dealer said the fan on the computer under the hood directly over where the lamp switch is is going bad - Need replacement. The Oil Light stays on longer than usual after each start- atimes up to sixty seconds- Dealer says a switch must be replaced. Oil pan must be removed to do that. Remote key works occassionaly now. I bought this vehicle at 69,000 miles about 9 months ago (September 2006. It is a beautiful car which I bought out of town - 400 miles away from home. I flew down and drove it home. It was a breeze to drive - excellent handling, good response from the 2.5 litre engine and good display of fuel consumption and miles statistics. I have never used a similar product in this category. I have driven a Honda Civic, Ford taurus, Mercury Villager and now own a BMW and a Mercedes Benz R350. My R350 is 8 months old - No issues. I had my fair share of repairs with my Taurus(no transmission or gasket problems - sold it at 200,000 miles); Sold my Honda Civie at 65,000 miles and my Villager at 98,000 miles. They were all reliable cars as far as I am concerned if you do your part - maintenance. Takes premium fuel which works out to an extra $3 per week with how much driving I do... This is well worth it, when you consider the power they get from that inline 6. The BMW 3 series is unlike any other car. Everything from the time your fire the silky smooth inline 6 to accelleration, to handling, to ride, to braking is superb. The interior is ultra high quality and very comfortable with all the controls easily within reach. It is the best combination of quiet, smooth, quality, and performance that I've ever experienced. Quality, handling, fuel economy, fit and finish. Could use a 6th gear and a little more power I suppose. Expensive to maintain. This has pretty much been the best car I've ever owned. The build quality is fantastic, it gets good gas mileage, handles great, fun to drive, reliable, etc, etc. The car is now 11 years old (I have owned for 2). The interior looks almost brand new. Porsche 928, DeLorean, Taurus SHO, Pontiac Trans Am. Reliability, gas mileage, looks, handling, build quality. Sunroof started rattling at 100K. I have not been able to fix it. Bought this car in 1998 with 70,000 miles on it. I now have just under 160,000 miles and have done nothing but routine service. I normally don't keep a car for as long as I've kept this one, but it's just too good to get rid of (and with the mileage on it now it's virtually worthless as a trade-in) I'm just going to keep driving it until it quits. I have no idea how long that will be. It is not a reliable car after being used more than 5 years. I spent at least $5000 for repairing it within two years. Don't recommend buying a used car like that. All that I praised initially still holds--solid handling, very comfortable, peppy, conservative good looks, and safe. Great winter car. Fit and finish have remained almost flawless--still looks like a new car inside and out. 1. Brakes wore out quickly (25,000 miles), and rotors went with them: we drive very conservatively and have usually had long life from brakes on all our other cars. $800 fix. 2. Four returns for window regulator/window rattle problems. Design flaw allows very heavy duty regulator system to rely on the integrity of a cheap plastic clip that can wreck the whole system if it fails. Need to attend to any window rattles immediately or risk loss of regulator system. BMW may have fixed this on newer models. 3. Fan bound up and resistor pack blew at 35,000 miles. $300 fix. 4. Both front control arms loosened before 40,000 miles. $600 fixes. 5. Water pump went at 40,000. $500 fix. 6. Both rear coils broke at 40,000--again despite very conservative driving habits. $650 fix. 7. Cheap spring nuts holding underside weather shield keep popping out and causing rattles. Easy to fix, but a pain to keep repeating. Also, need to remove shield to change oil--a stupid design glitch. 8. A/C electrical control had to be replaced (warranty fix). This is a follow up after 6 years of driving the 325xi. My feelings after six years with the car are decidedly more mixed than when we purchased it new. It remains the best driving car we've ever had, but the increasing reliability problems, mediocre gas mileage (and premium gas requirement), and cost of repairs has us looking elsewhere for our next car. May be a bit like having a bright, fun, great looking spouse who drinks too much and makes a lot of messes. The star rating below doesn't tell the story very well. It is a 5-star car to drive and not unreasonably priced for its highway performance, but a 2 to 3-star car for its glitches and repair costs. A car that drives like this and has the reliability of the Toyotas we've owned (and with good gas mileage and regular gas) would be worth a few more bucks than the 325xi. Toyota Corolla,Camry. Mazda 626. Honda Accord. I have owned this car for a little less than a year, & read a ton of reviews about it. So I had to buy one, & see for myself. It's not perfect, but if this is the type of car your looking for, it's as good as they come. I did not buy it for gas mileage, but it's acceptable. I bought it for handling, driver AND "passenger" comfort. Good power & sound, a flawless shifting transmission, and a solid feel that cannot be matched by any of the competion. Yes, I love the car but it's not perfect, but then again which car is? ?